We were cycling around the lake at Tata and stopped in front of the Marble Hill cliff where there is an open air geological museum with a collection large rock samples from around Hungary, representative of each type of rock found in the various areas and mountains of Hungary. 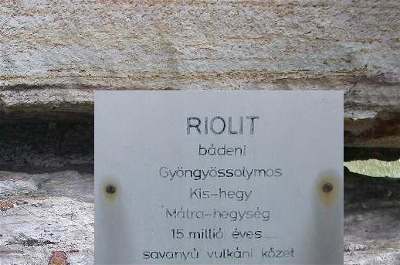 The centre is maintained by the Hungarian National Geological Institute and the Loránd Eötvös University of Science (ELTE) and it is a popular destination for research and education. The local area is unusual in that it has examples of rocks from three of the Earth's Mesozoic Era: Triassic, Jurassic and Cretaceous. See the following pictures of the various types of rocks on display around the open area geological trail. The Mesozoic bedrock, at a height of 161m above sea level has risen and fallen several times in the last few hundred million years. 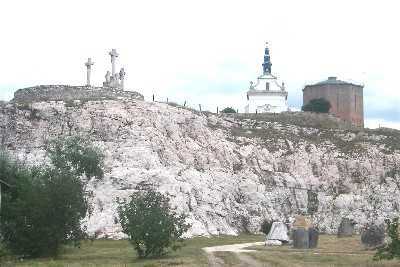 The oldest rock at Calvary Hill is the Dachstein limestone from the Upper Triassic period about 200 million years ago. During the Jurassic period (131-150 million years ago) marine limestone layers were formed. 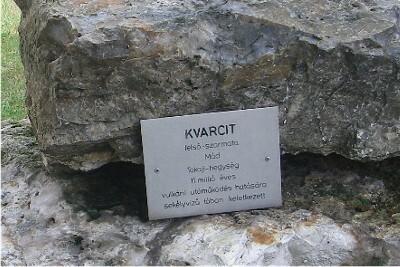 Gneiss: karbon Sopron Varosi kőfejtő 330 million years metamorfozis reven atalakult granit. 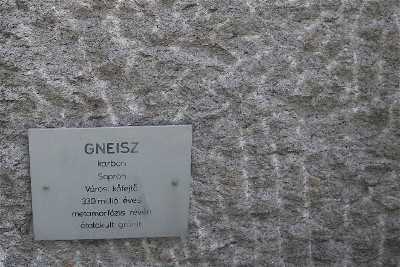 Gneiss is a common rock formed by metamorphic processes from preexisting igneous or sedimentary rocks. Fossil casts and impressions of numerous marine creatures from the Cretaceous period (about 110 million years ago) are preserved in what used to be coastal hills. 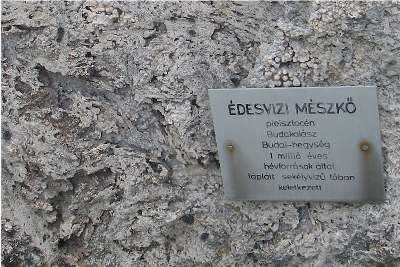 édesvizi mèszkö Pleisztocén Budakalász Budal-hegység 1 million years. hevforrások attat tápláit sekélyvisü toban keletkezett. To me this looks like limestone tufa as found in a gorge near Malham cove. This looks like the Bass Rock or stone out of North Berwick Law quarry. 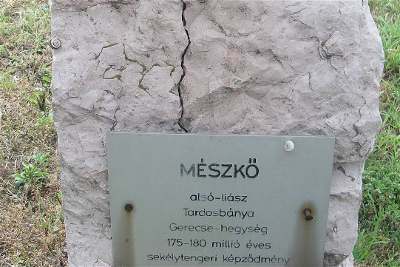 Konglomerátum alsó-triász Cserkút Mecsek-hegység 230 million years szárazföldi-folyóvizi képzödmény - Conglomerate to me. 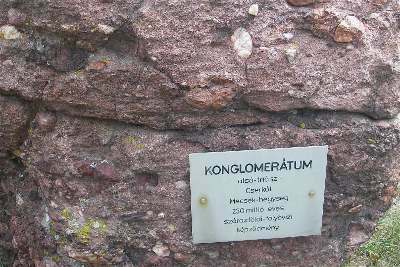 A conglomerate is a sedimentary rock with embedded individual rounded stones that have become cemented together. 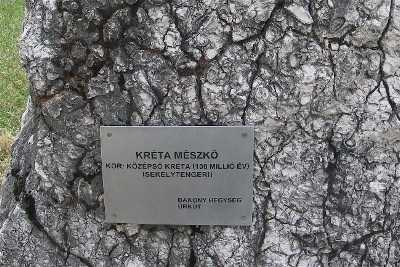 Kréta Mészkő: Kor: Középsö kréta (100 million years) sekélytengeri. Bakony Hegység úrkut. 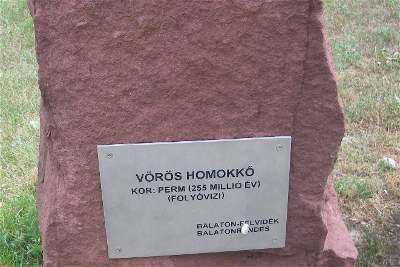 Kvarcit: felso-szarmata Mad fakaj-hegyseg 11 Millionyears vulkaru utamukodes hatasara sekelyvizu tobon kelelkezelt. 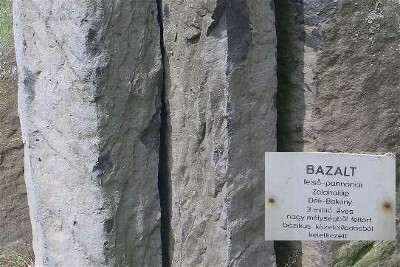 Quartzite is a hard, metamorphic rock which was originally sandstone. It is NOT the mineral quartz. 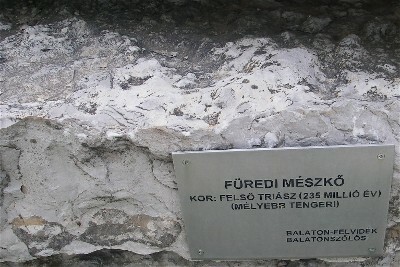 Basalt: felső-pannóniai Zalahaláp Deli-Bakony 3 million years nagy melysegbol feltort bazikus kozetolvasbol keletkezett. Basalt is a volcanic rock, with the large hexagonal shapes formed during the very slow solidification of cooling lava. This looks similar to the basalt columns as seen in Giants Causeway, Ireland, in France and north of Lake Balaton. The hexagonal columns are the recognisable feature although the columns are not always exact hexagons. 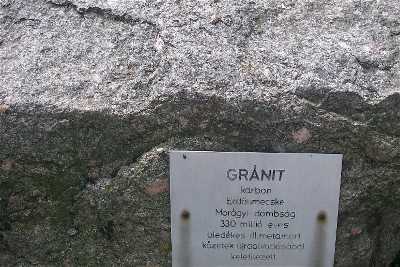 Granite: karbon Erdösmecske Moragyi-dombsag 330 million years üledekes illmetamorf kőzetek ujraolvadasbol keletkezett. I recognise this as Granite similar to the top of Ingleborough hill.